In the bathroom we find one of the few rooms in our homes where we can freely play around with different materials for wall surfaces. Using materials such as stone, ceramics items, wallpaper or tiling is a great way to add texture and real character to the room we're first drawn to upon awakening. The waterproof elements, of substances such as stone, ensures your walls stay protected as well as look great for an extensive period of time—which, of course, is rather important in a largely damp room. One tiling style that's perfectly suited for the bathroom is that of mosaic. This method of decorating, the congregation of small but charming stone tiles, glass or other materials, can be a real dazzle in the bathrooms and set your design aside from the rest. These elements are stuck onto place using lime mortar, cement and or resin and, when something goes awry, once in place is easy to repair and clean. Take a look at this ideabook for some good examples of just how to implement a design of this style. Here we see a very traditional take on mosaic tiling, a small variation on one colour used in repetition, randomly set amongst one another to create a beautiful blue hue, almost resembling a calmly drifting tropical ocean. A modern bathroom, complete with a free standing tub and a decorative, towel stand, ladder. 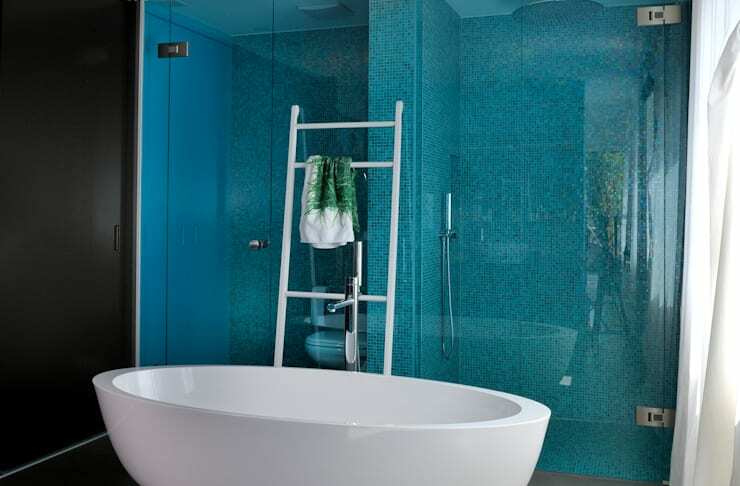 The transparency of the glass and the intense blue of the wall enhance the element of freshness. The perfect room to cleanse and begin ones day. Here is another equally as beautiful example of mosaic use, in the form of this shower walls. Here we see the elegant use of mosaics and their combination with a pearlescent surface. 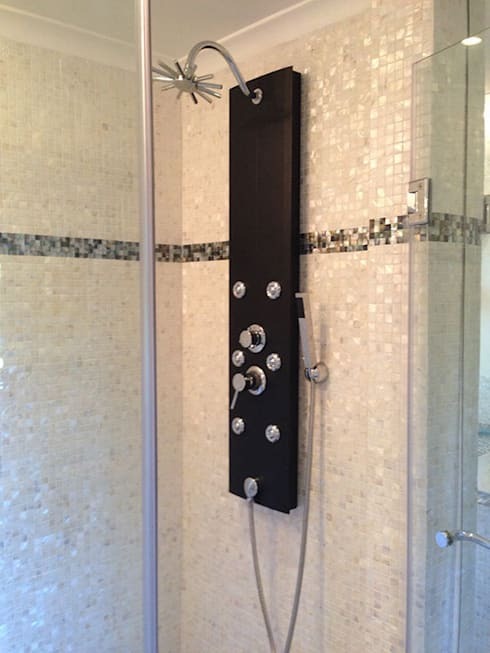 The rather unusual shower head and shower jets ensure you will feel nothing short of pampered if you're fortunate enough to be inside this saucy little number. 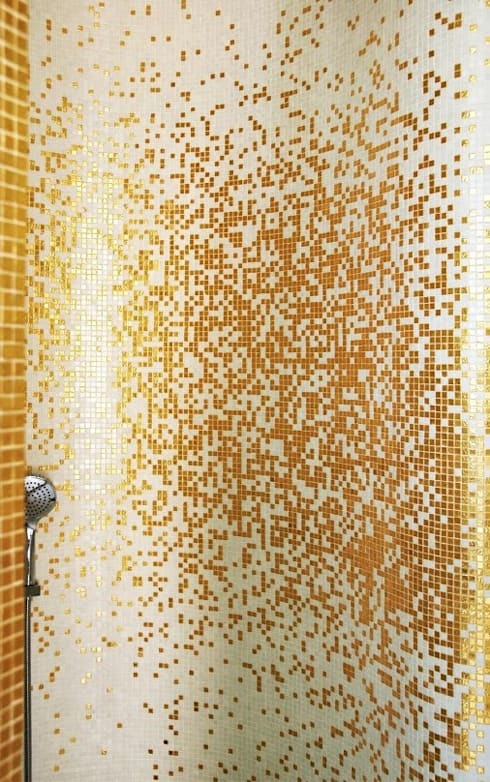 This mosaic pattern in a shower cubicle allows the bathroom to take on a golden glow, completely illuminating its interior look and adding, potentially, to a lavish look around the home. Chaotically arranged mosaic pieces make you feel like your being sucked into a moon-age daydream or a dimensional warp to another world! The shape and size of this room, as well as the presence of an open fire place, immediately suggests one thing—this room has been renovated from a lounge or dining room to become a modern, and quite frankly awesome, bathroom. The chandelier, fire place and sheer size of the room ooze character and luxury that really speaks a lot about the person who would reside here. 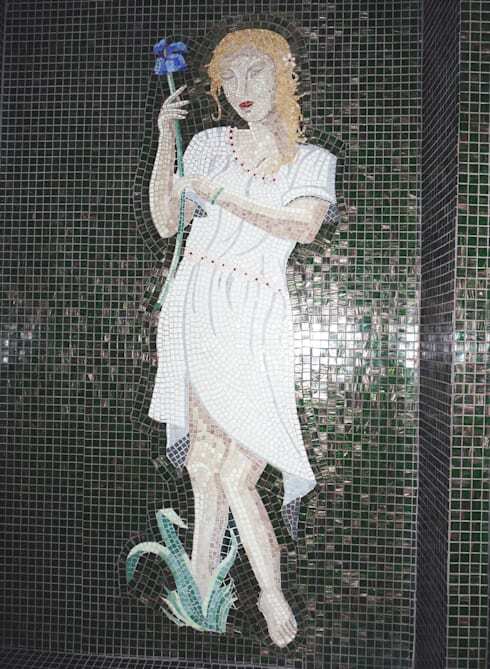 Mosaic tiles made of porcelain were chosen for the shower, matching the green floor tiles. 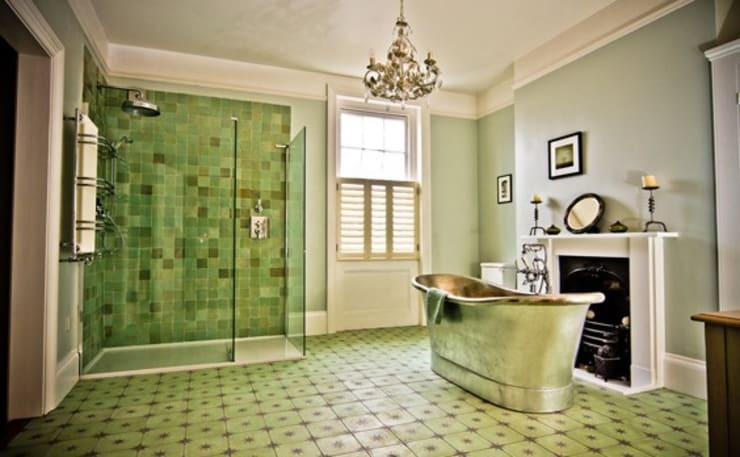 The noteworthy steel bathtub tries very hard to take centre stage in this room, glowing green from the reflection of the tiles on its polished finish—completing the charm of the whole composition. Mosaics do not have to simply create patterns, they can be used to create unique works of art—this was, in fact, their original use. This creation uses moisture-resistant materials, such as glass and acrylic, covered with enamel. The decoration gives a bathroom a highly individual and unique look that is sure to have an enormous impact on how others and yourself perceive it. In this picture we can see an example of a bathroom with an almost rustic vibe, slightly tweaked with the inclusion of a mosaic-esque wall covered, made of stones in shades of beige and light brown. The colour scheme of the wall works well with the warm timber surroundings and white ceramics. A mosaic made of a naturally occuring material is slightly less common to find, but adds a raw and earthy appearance to this scene.